Darien B. Cooper is a wife, mother, lecturer and author of several books including the best seller, You Can be the Wife of a Happy Husband, with over a million in print. She graduated from Carson Newman College in Jefferson City, Tennessee with a degree in Sociology and double minor in Psychology and Mathematics. Her practical teaching on the woman’s role in marriage and complete abandonment to Jesus Christ has changed countless lives both in the USA and abroad. 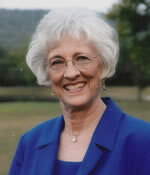 She and her husband, DeWitt, served as associate staff with Campus Crusade for Christ Lay Ministry in the early 70’s. In the mid 80’s they served as missionaries with Family Consultation Service, a ministry to the poor in the inner city of Atlanta, Georgia, for eight years. During that time, DeWitt built some 80 houses and Darien worked with family selection and community building. This was a drastic change in every area of their lives. They were now faith missionaries living in a different culture. DeWitt was operating in his areas of strength – compassion for the needy and construction. He had been "called" and Darien felt drafted! God worked miraculously in both of their lives. By the time they moved, Darien could have lived there for the rest of her life with contentment and a new compassion for the needy. Then God’s assignment changed. In 1993, they left Atlanta, their home for 35 years, to move to north Georgia. Along with DeWitt’s mother, two of their sons and their families, they moved to the Dalton area where their youngest son was already established. Four generations lived under the same roof for sixteen months until their middle son’s house was built. A year later, their youngest son and his family lived with them for a few months while their house was being built on the original 26 acres. The book, You Can Be the Happy Mom of an Empty Nest, was published in 1999 from lessons learned by living intimately with loved ones and yet releasing them to be what God called them to be. After seven years and DeWitt’s mother’s home going, their oldest son and his family made their home in the original house with DeWitt and Darien moving into expanded quarters on the lower level. Another bonus happened when Darien’s only sibling, Jan, her husband and their parents moved into their homes that they built on this property. Two of Jan’s married children have also moved to the area. What a blessing to learn to purify their relationships and untangle the fleshly ways that so easily beset us in this intimate setting. It was God’s idea to "circle their wagons" in this way. Darien would have never dreamed that such a thing could happen. His ways are mighty to behold. Their grandchildren have increased from six to twelve since moving to north Georgia. They are now an international family with five of their youngest grandchildren being adopted from three other nationalities. After 30 miraculous years of being in publication, You Can Be the Wife of a Happy Husband, has been revised. The foundational truths are the same. God’s Word does not change. God has, however, expanded Darien’s insight and maturity in the application of these core truths. DeWitt and Darien find that their appreciation and love for each other continues to grow. They are learning what true unity and love are. It comes from having their hunger and thirst satisfied by their intimate walk with Jesus (John 6:35) and their identity in Him. As He is their portion (Psalms 16:5), they are learning to embrace each other without requiring or expecting the other to be more than God made them to be. This enables them to say, “I’m a happy wife” and “I’m a happy husband” because their happiness comes through their intimate love walk with Jesus not what their mate is or is not doing. His Way Library was formed to market the truths Darien teaches, making them transferable for individual or group study. Feel free to follow Darien on Facebook. Women's conferences and retreats are Darien's speciality. She prefers to work with groups who will commit to studying one or more of her series following an engagement. This provides an opportunity for the truths to be established in those that are hungry. Exceptions are made according to individual situations and requests. Darien requires that all expenses of travel and lodging be provided by the host. Her honorarium is left to the leading of the Lord through the host group. To hear Darien's monthly messages, go to her messages page at Relationship Church.